MiP stands for “Mobile inverted Pendulum” and you can almost see that from the design – which was developed in associated with the University of California at San Diego. WowWee’s MiP robot is fully interactive as you would expect from today’s robot toys. It is able to move around easily thanks to the almost segway like design of its dual wheel balancing system. 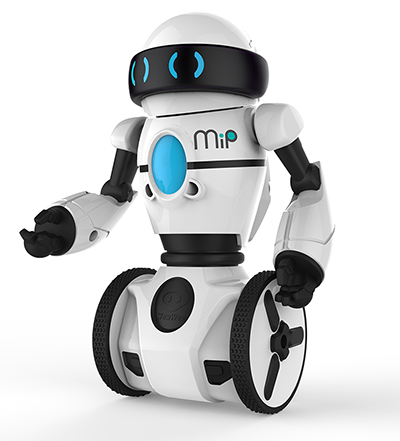 Like some other robot toys, the WowWee MiP robot responds to various gestures, made by hand or using objects, and MiP can also be controlled via an Android or Apple device using the Bluetooth capability. 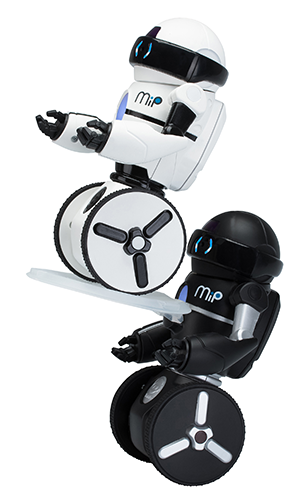 MiP can also dance to music and learn commands. A feature of MiP is the tray accessory which is included, and when attached it lets MiP balance objects, even while moving. Dad wants you to pass the remote control? Give it to MiP and send it over!